I’ve shared many thoughts from my recent three-month ship adventure, and this is my final ship related blog. This covers the miscellaneous things I learned while on the sea that didn’t fit in anywhere else. Nailing everything and everyone down. One of the first things you’re told when getting on the ship is the necessity of securing all your belongings. This cannot be stressed enough. 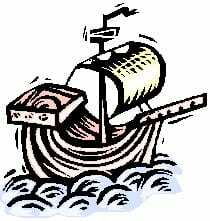 Once the ship started rolling, everything not nailed down would fly through the air. Dressers need to be permanently attached to the bulkhead. If they aren’t, then bungee cords or Velcro are a must. When the ship rolls, medicine cabinet doors might open/shut. Shampoo might roll around in the shower. Everything had to be in a container of some sort or attached to something. At dinner, we sometimes had people slide across the deck in their chairs. Mind you, these were not chairs with rolling wheels, but normal flat-footed chairs. It made no difference. If the deck was at any angle over 15 degrees, you would slide. We all got very good at hanging onto the table at the first sign of rolling. The easy way to walk in stairwells. Often times, you’ll have to go up or down a ladderwell when the ship is rocking and rolling. This is totally do-able. In fact, it is easier than normally walking up or down stairs. But only if you follow these directions. When walking up, wait until the ship is on a downward roll in the same direction you are standing. Then walk “up” stairs. What happens in reality is the stairs tilt downwards, making the angle less difficult to walk up. Going downstairs, you should do the opposite, so you’re not thrown down the stairs. Hang on to the railing, and walk into the roll. What not to forget to bring. Duct tape, Velcro, Wall hooks, Bungee Cords, a good flashlight, a good pocketknife, WD-40. There is something incredibly heart-stopping about the sound of a helicopter hovering right above you. Perhaps it’s reminiscent of old M*A*S*H* episodes. Or maybe it’s a reminder of news reports which show helicopters with scenes of destruction below. Perhaps it’s because of the image of rescue helicopters which land at accident sites or jungle rescues. Whatever the reason, hearing the throaty thwupa-thwupa-thwupa of helicopter blades just makes everyone pause and watch. 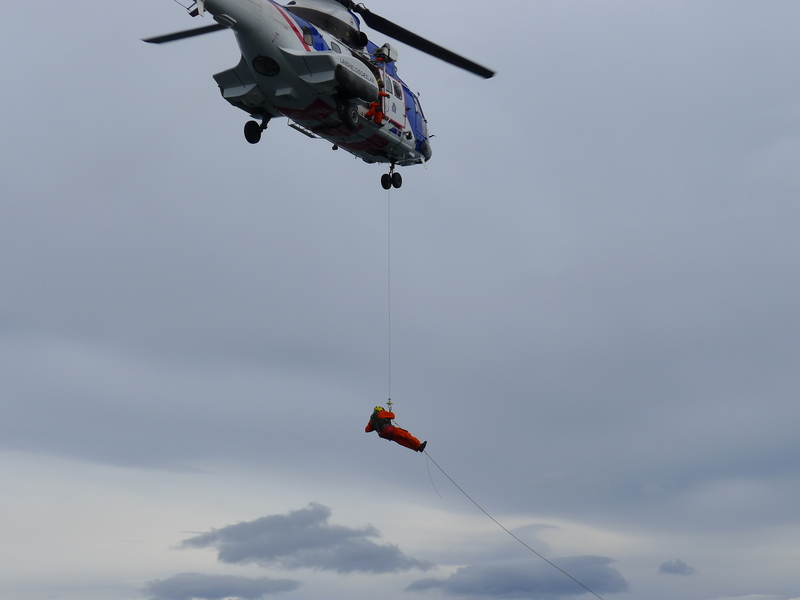 As we left Iceland, the Icelandic Coast Guard used our ship to practice their rescue mission. Specifically, they dropped a rescuer onto the ship. That person was followed by the basket. Then they reversed the order and returned both to the helicopter. This occurred twice, and was really quite impactful. Another occurrence that can’t be ignored if you are nearby is the anchor being let down. A 6 ton anchor is dropped 450 feet. The huge metal anchor chain clanks faster and faster as the chief mate holds up fingers indicating how many 90-foot sections have dropped. The chain is so heavy that it takes three or four strong men to stop it. So they drop it three x 90 feet. 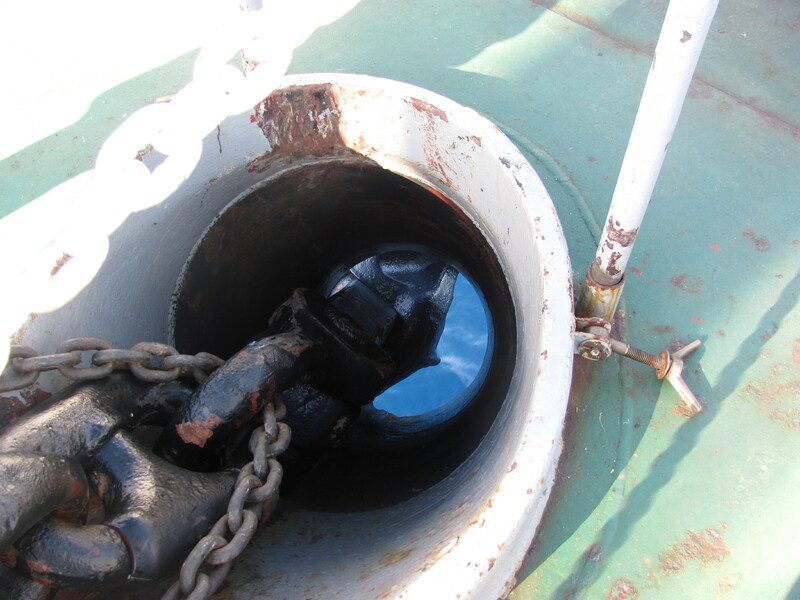 Then they stop to determine whether the anchor has connected, then drop it another two x 90 feet. It’s a very impressive undertaking. A retired gentleman in Liverpool who was watching our boat come in. He shared his love for AIS (tracking systems for ships). He gave us good ideas on where NOT to go during our visit. What a wonderful chat we had! The proprietor of the oldest bar in Gibraltar. He lent us his personal travel book for Spain and gave us some great ideas of places to go, just asking in return for our comments and his book back. A salesclerk who worked in a booth in a mall in Virginia. She went out of her way to help find a pharmacy, including making phone calls and obtaining directions. A tour driver in the Azores who spent quite a bit of time with me talking about the Catholic rituals in a small town we visited. He did this on his break time. The wonderfully friendly horse trainers in Iceland who gave us an almost double the normal horse ride and were full of fun and interesting stories through the ride. Incredibly interesting and friendly people at a Gibraltar party. They obviously love their lives and their country and were willing to share both. As I mentioned in my first trip-related blog, I took this three-month opportunity because it spoke to the wanderlust in my soul. I absolutely loved this adventure, but I found that it did not quench my wanderlust. It only strengthened it. The world is such a beautiful and interesting place, and so are its people, animals and scenery, and I’ve only just begun to enjoy it all.